All of the existing cabinetry, tile, tub/shower and a glass block window were all removed. A new window was framed and new glass block was installed. The Regency team designed a new larger shower with a seat and a double niche were installed with the beautiful beige tile and the look was completed with a stunning granite trim and granite counter tops. 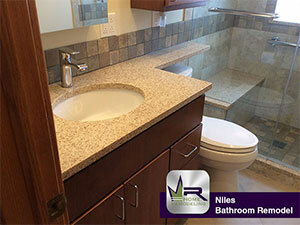 The crème colored 12×12 floor tiles and the new wood vanity completed the entire look. We installed 12×24 porcelain tile from the Torreon Collection in Brino throughout from daltile. The natural variance of these tiles gives a modern look to the space. 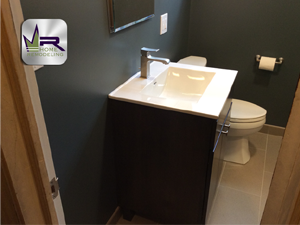 Next, we added a Bertch vanity cabinet in shale with a Riobel Zendo faucet in brushed nickel and a Fairmont sink top in white.